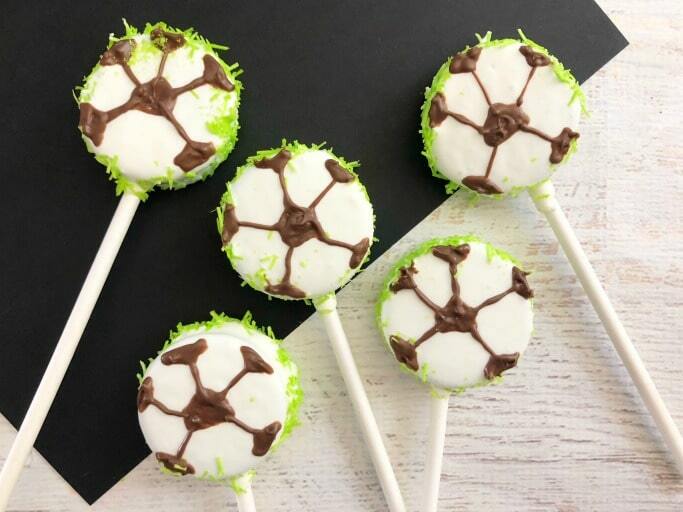 Want to make a fun and memorable treat for your kid’s soccer team this season? 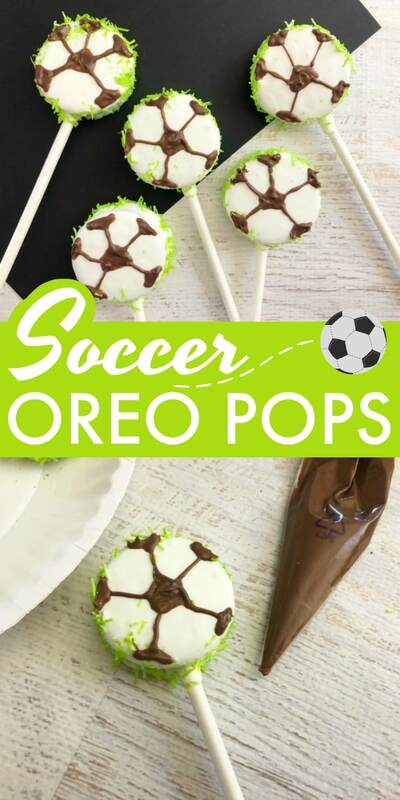 Try these Soccer Oreo Pops! 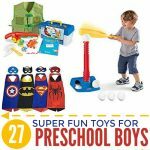 Not only are they super cute, but they’re really easy to make once you get the hang of them, so you’ll be able to do them for other sports like baseball and basketball, too. 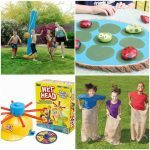 After all, team snacks are just part of the fun! You guys… I can’t tell you how much fun we had with our son playing soccer this past year. It was his first year ever, and we were hesitant to even get him into sports, but soccer was a great choice. He started in the fall and was lucky enough to have several buddies on the team. Okay, so we never won a single game… and we had to ask them to stop hugging long enough to play… but it was an absolute blast. When we signed up for the spring soccer season, we didn’t realize how much the baseball schedule interfered with the soccer schedule. He was only able to play in three soccer games, and none of his friends were on the team. But this team was very talented, and it pushed him to run faster, focus, and kick harder, so I’d call that a win, too. 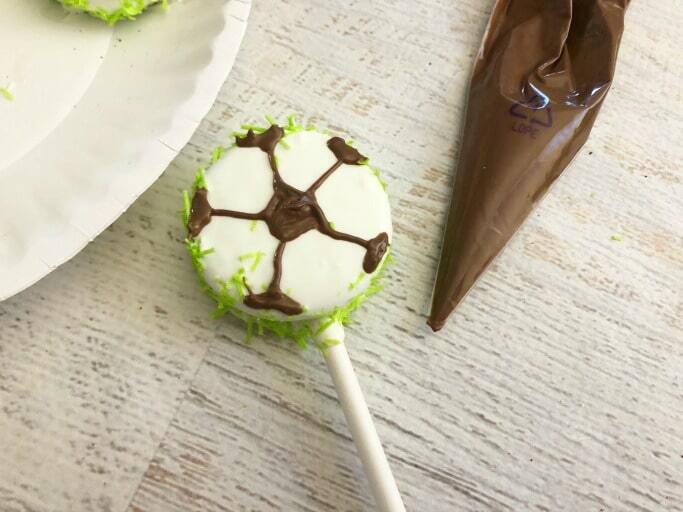 But you’re here for the soccer oreo pops, right? They’re so cute! I can’t wait to make these for the kiddo’s soccer team this fall. Read our 5 Reasons to Let Your Kids Play Soccer for some great life lessons kids learn from playing the sport. 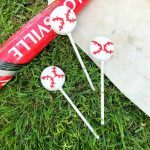 Check out our Baseball Oreo Pops if you need treats for the baseball team! 1. Place a piece of parchment paper or wax paper on a baking sheet. 2. 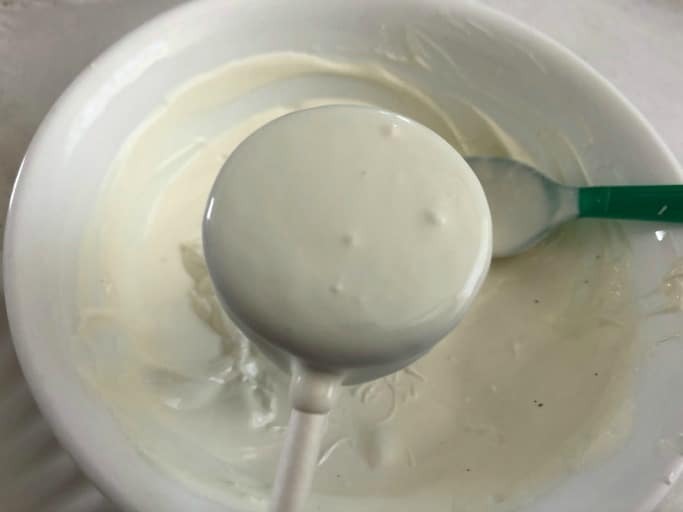 Heat white candy melts in a small bowl on 50% power in the microwave for 3-4 minutes, stirring every 30 seconds until melted. It may not require 3-4 minutes… just repeat the 30-second process until the candy is melted and smooth. 3. 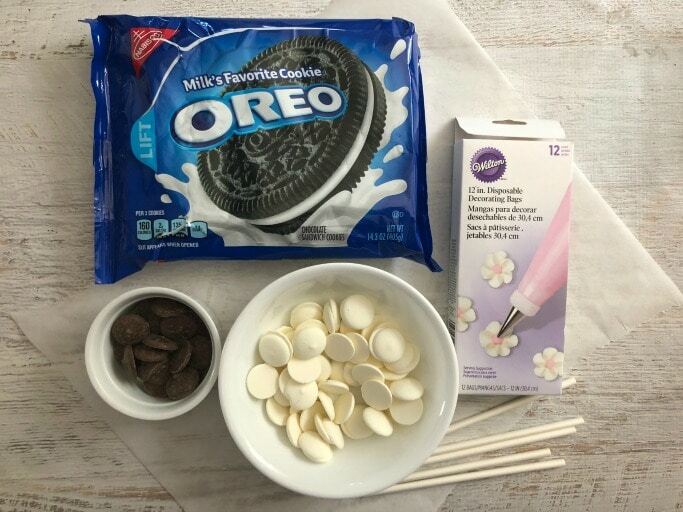 Open each Oreo, dip the end of each lollipop stick heavily into the melted white chocolate, and press the stick carefully into the white filling. 4. Scoop a little more of the melted candy onto the center and press the cookies together. 5. Allow the chocolate to harden then hold the stick and dip the Oreo into the melted chocolate, letting any excess drip off. 6. Roll the outside edges in your candy grass. 7. Place the Oreo pops on the lined baking sheet and transfer to the freezer for 10 minutes. 8. Heat the brown or black candy melts on 50% power for 3-4 minutes, stirring every 30 seconds until melted. Pour into a decorating bag and cut a tiny tip off the bottom. 9. 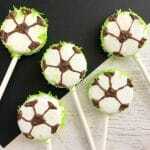 Use the melted brown candy decorating bag to draw the soccer hexagons and lines on the soccer oreo pops. Let harden for about 10 minutes. 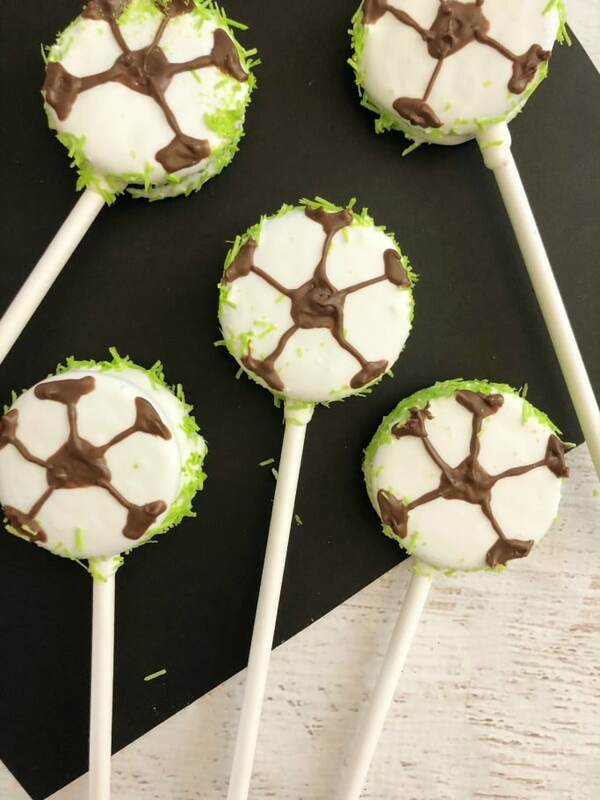 These adorable soccer Oreo pops will make you an instant hit with the team! They're easy to make, and make great soccer party favors, too. 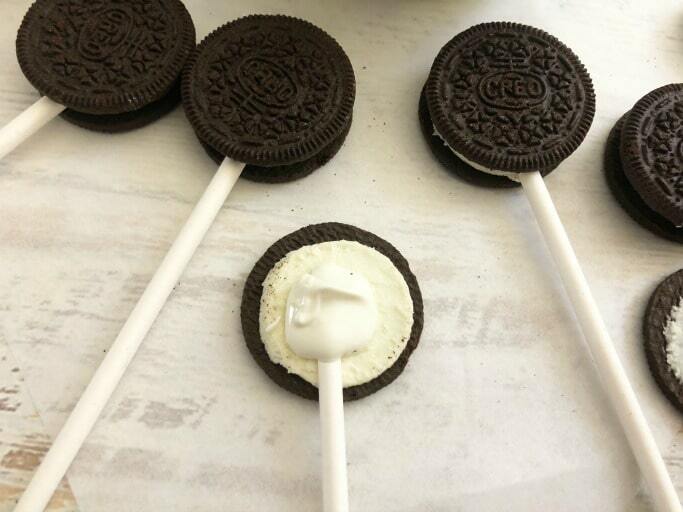 Open each Oreo, dip the end of each lollipop stick heavily into the melted white chocolate and press your stick carefully into the white filling.